"What do we have now? A hunt on corrupt officials that the PGO, NABU, the Security Service and Interior Ministry staged." President Petro Poroshenko said that the Ukrainian law enforcers unleashed to hunt for corrupt officials. 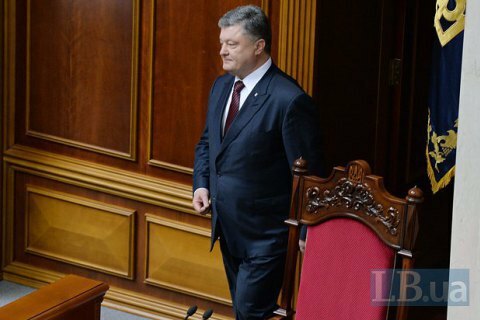 "What we have now is a hunt, and I deliberately use this word, that PGO, NABU, the Security Service and Interior Ministry staged against corruption," Poroshenko said as he spoke to the parliament 6 September on the domestic and international situation of Ukraine. "This hunt is unprecedentedly inclusive. No investigation to date has involved that many officials. I would have been more convincing if I listed posts, and named the names and charges, but it would take a bulk part of my address here." President said the arrests have no political overtones, though. "One has to realize the new reality - a real hunt on corrupt has begun, and anyone who is not without a sin stands a chance to get caught into these fishnets," Poroshenko warned. There are countries, Poroshenko admitted, where corruption is fraught with death penalty, but they take bribes even there. The head of state asked not to reduce the fight against corruption down to purely punitive measures. No less important are preventive policies, Poroshenko said, such as introduction of electronic declaration of income, deregulation to minimize the contacts of business with government officials etc. In 2014 Poroshenko said the fight against corruption was his personal responsibility.